BaxterSports Camps started a decade ago with our award-winning soccer summer camp and quickly expanded to All-Sports Camps all year long. We added Winter Break Camp and Spring Break Camp in 2014 to make sure that kids from 5 to 13 have somewhere fun to go and something fun to do even when school is out on break. Every day, we offer something new for boys and girls from kindergarten through 8th grade. Winter Break Sports Camp is for active kids who love to play all kinds of sports. Our young athletes have fun working together on sports drills and playing on teams that change everyday to allow everyone to shine. Indoors at a local gymnasium, we play everything from basketball to soccer to capture-the-flag. We provide young athletes with half-day, full-day, and full-week options. Regardless of their duration of participation, each camper gets our full attention and our promise of a fun, complete sports experience. Even though it’s cold and wet outside, there is plenty to do inside with BaxterSports. We offer two weeks of winter break camp for our athletes to accommodate a range of holiday schedules. As soon as school is out, students can trade their books in for their sneakers and spend the day playing at the gym with us. Staying active over break is important for kids. Our young athletes have the chance to play with friends, run a little wild, and learn some new skills. We mix drills and practice with mini-tournaments and games. We also incorporate lessons on how to take care of healthy body through proper nutrition, a positive mental game, and team-building activities. Our players arrive with friends and make new ones throughout the week, expanding their community and their self-confidence in new and fun situations. Parents love knowing that their kids are participating in a sports enrichment program over the winter break that has award-winning success fostering sportsmanship and increasing confidence. They can be assured that the coaches at BaxterSports are committed to helping young athletes succeed both on the court and once school starts back up again. Instead of taking a break on the couch, at our camp your son will be playing extra soccer and your daughter will be working on her jump shot in a fun, no-pressure game with friends. Your kids will learn new games, like capture-the-flag, and enjoy old favorites like dodgeball. At the end of each day at Camp, they will have plenty of great stories to tell about their new moves or new friends. BaxterSports winter break camps offer something new to do every morning and every afternoon. This is a great opportunity for your child to learn a new sport in a friendly, low-stress environment. It is also a perfect space for your players to learn something new about a favorite game. On any given day, basketball players could have their chance to practice skills in drills and scrimmages while the next day will highlight a huge kickball tournament. Indoor soccer and capture-the-flag are always favorites! 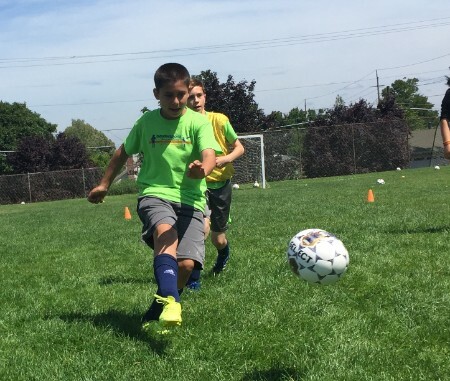 BaxterSports promotes having fun while building new skills, so each day at camp includes sessions devoted to learning something new about the game, strategies for succeeding, and practicing new moves and techniques. Players then have the chance to build on these skills in mixed teams, putting into action their new foul shot, pass, or defensive move. Working from the ground up as a team means that our players help and support each other, learning about teamwork and sportsmanship as well as the game. Young athletes are grouped by age and learn from each other as well as the coaches. We foster a strong sense of community, with older, more experienced players serving as role models on and off the court. We want our campers to remember that playing sports is always about having fun. If you’re not laughing and playing while you learn, then you’re not doing it right! At BaxterSports, we want the whole child to be a happy, healthy, well-rounded athlete not just over Break, but for life. While winter break camp follows a rhythm of practice and game-time, we also want kids to have time to just play. Our all-star staff act as both mentors and coaches, monitoring free time and coordinating group efforts, leading teams to victory while just letting kids be kids at the same time. We aim to balance play and productivity. Our goal is to build our young athletes’ confidence levels but taking the pressure off and turning the fun back on. They may come to camp confident in their soccer skills, but hesitant to play basketball. Our safe, friendly environment encourages risk-taking, trying something new, and being unafraid to try and try again.